Starting with iOS 10, Messages allows you to tap to send stickers in a thread, adjust their size, rotate them or peel and place stickers on top of bubbles, other stickers and photos in your conversations. 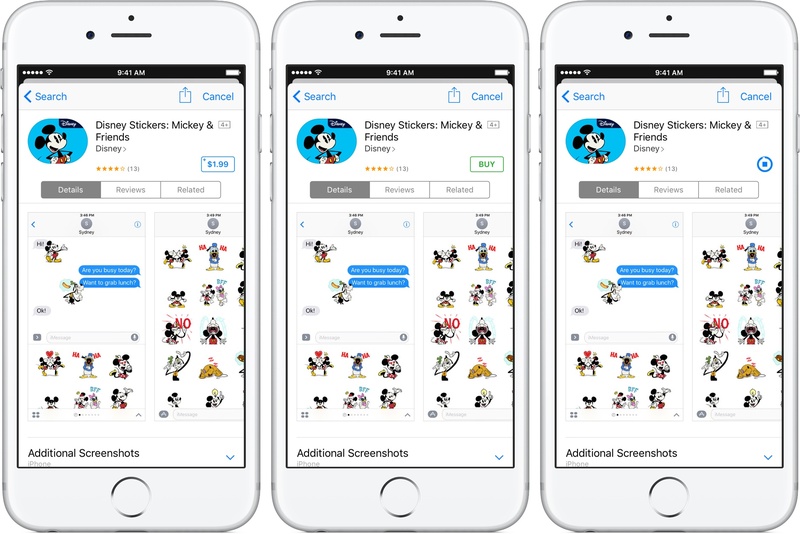 Anyone can create stickers without no coding experience and users can download them through the built-in Messages App Store. In this tutorial, you’ll learn how to obtain, use and manage Messages stickers like a pro and spruce up your messaging game. Before we get started, here are some commonly asked questions about stickers in Messages, how they’re created and distributed and more. What are the system requirements for stickers? 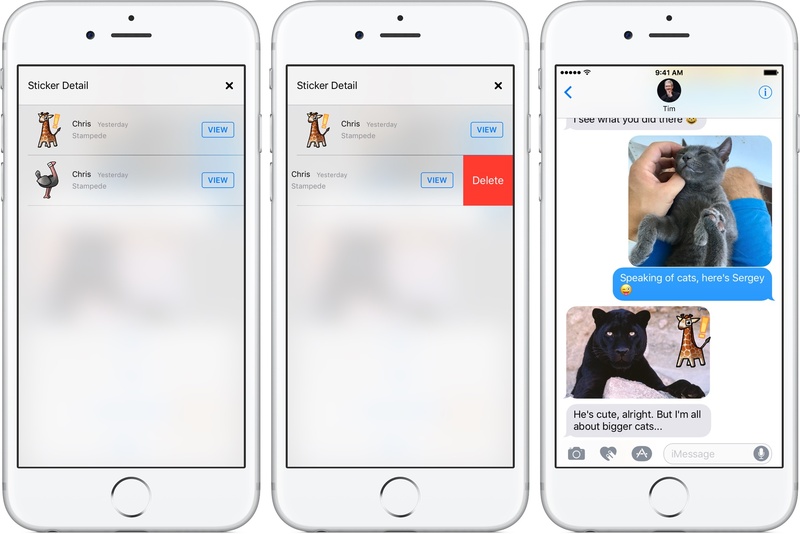 Sending and receiving stickers requires an iPhone, iPad or iPod touch with iOS 10 or later. 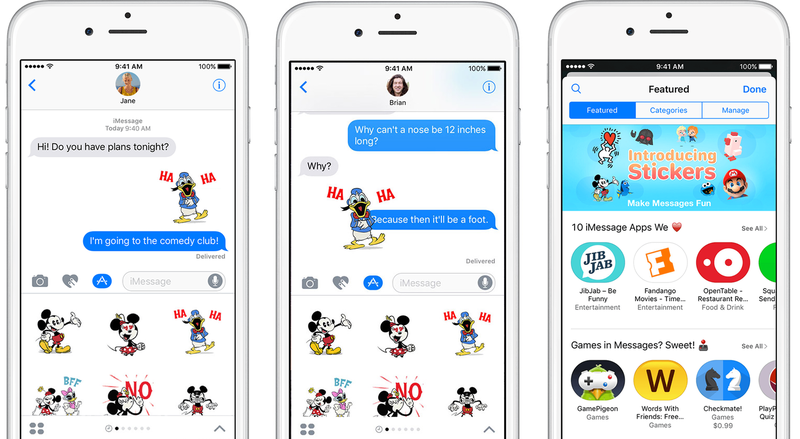 macOS Sierra users can receive, but not send or download stickers because Messages for the Mac lacks a built-in App Store. 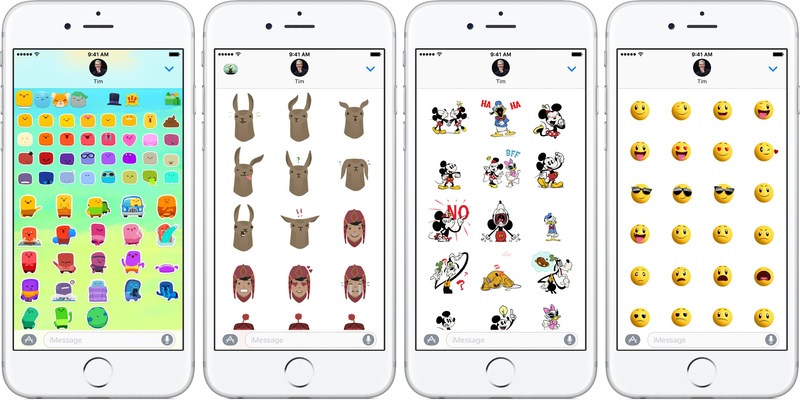 Non-iMessage users receive stickers as MMS image attachments. What types of stickers are there? Do I need to pay for stickers? Many high-quality sticker packs will cost you some money. That’s especially the case for branded sticker packs like Disney and Star Wars, for example. People who are reluctant to buy stickers needn’t worry as there are plenty of free sticker packs available in the App Store to get you started. 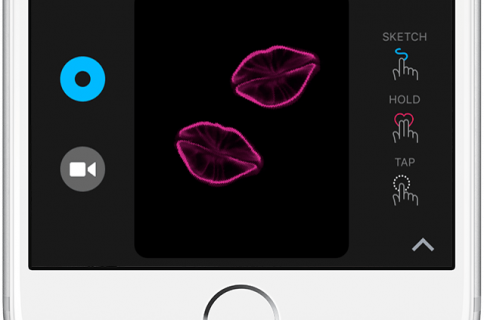 Just about anyone can create stickers without any prior coding experience. Static stickers are made from a set of image files in PNG, JPEG or GIF format that you can create in image editing programs such as Pixelmator and Adobe Photoshop. Animated stickers are made in Apple’s Motion app as APNG or GIF files. To create and submit sticker packs, you will need a Mac and a developer account with Apple, plus know your way around Xcode 8 which you’ll use to turn individual images into a sticker pack that’s ready to submit to the App Store. 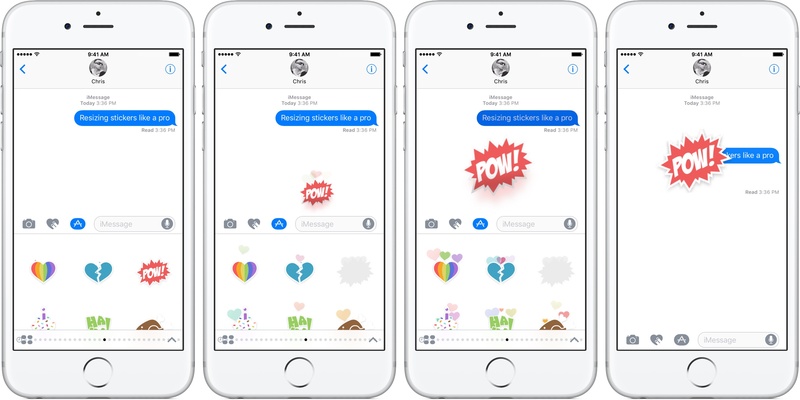 A great starting point to familiarize yourself with the whole sticker creation process is Apple’s Creating Stickers for iMessage webpage. Stickers are distributed as downloadable sticker packs in the App Store. 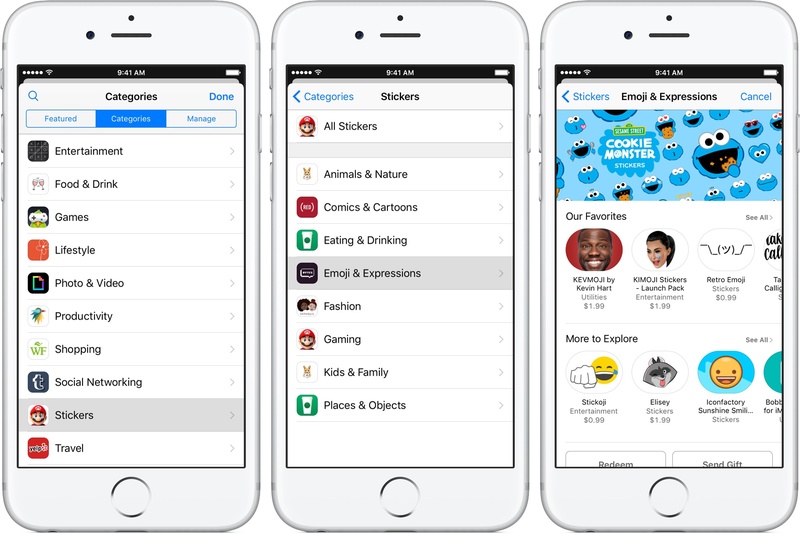 Sticker packs can be standalone downloads or bundled with apps and games. Standalone stickers put an icon on your Home screen and can be normally re-downloaded through the App Store’s Purchased section like any other iPhone or iPad app. Standalone sticker packs are labeled with “Only for iMessage” in the App Store. Bundled stickers are distributed as part of apps or games and don’t have their own Home screen icon. Removing a container app/game from the Home screen also uninstalls its underlying sticker pack(s). Apps bundled with stickers are labeled with “Offers iMessage App” in the App Store. 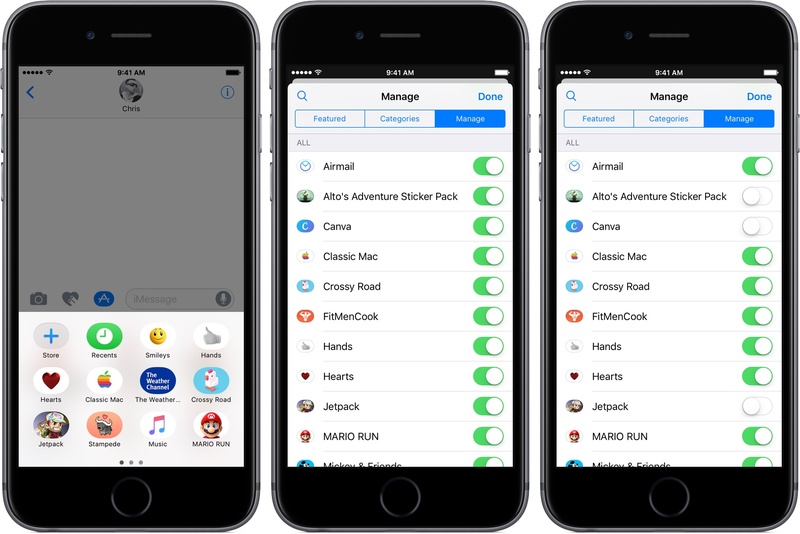 Any installed sticker packs can be managed via the Messages App Store’s Manage tab. Can I receive stickers if I don’t have them installed? Your friends and family can send you stickers that you do not have installed on your device and they will be displayed normally, and vice versa. You must, however, install a sticker pack before you can send any of its stickers. If you’d like to, you can easily download the underlying sticker pack right from any received sticker in the conversation. 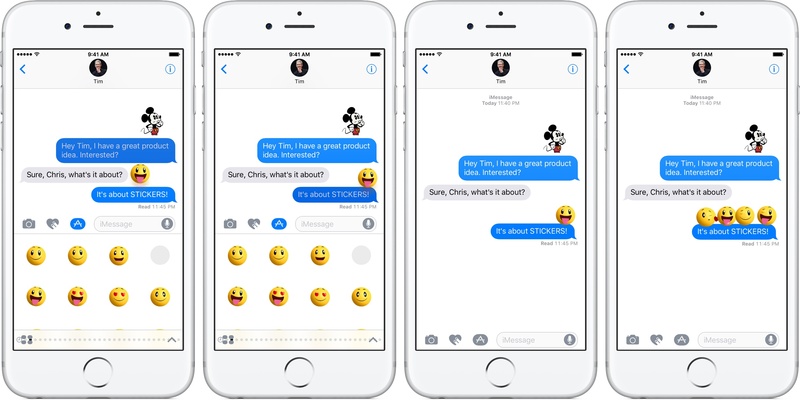 Can non-iMessage users and older devices see stickers? 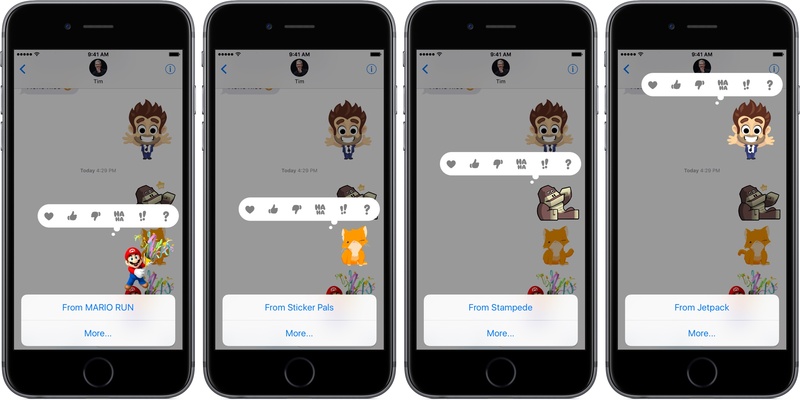 Static stickers sent as is to non-iMessage users (folks on Android or other non-Apple platforms) are delivered via MMS as image attachments. Animated stickers are also delivered via MMS to non-iOS 10/macOS Sierra devices but appear for the recipient as static images that don’t animate. A sticker cannot be attached to a specific bubble for contacts who don’t use iMessage. 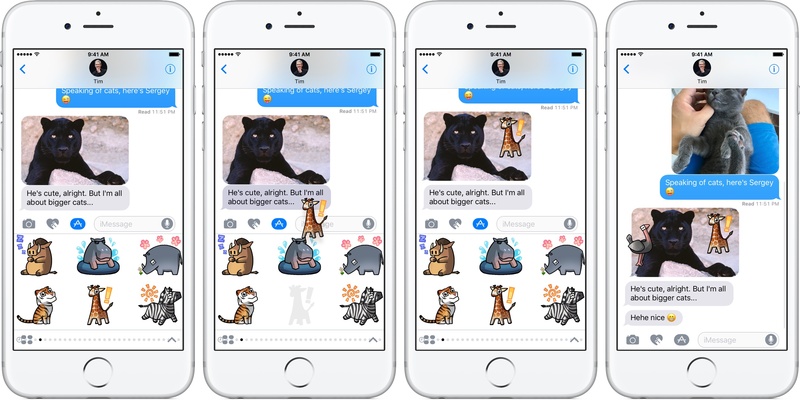 Stickers you stamp on chat bubbles or photos load one after the other for iOS and Mac users who haven’t upgraded yet to iOS 10 and macOS Sierra. 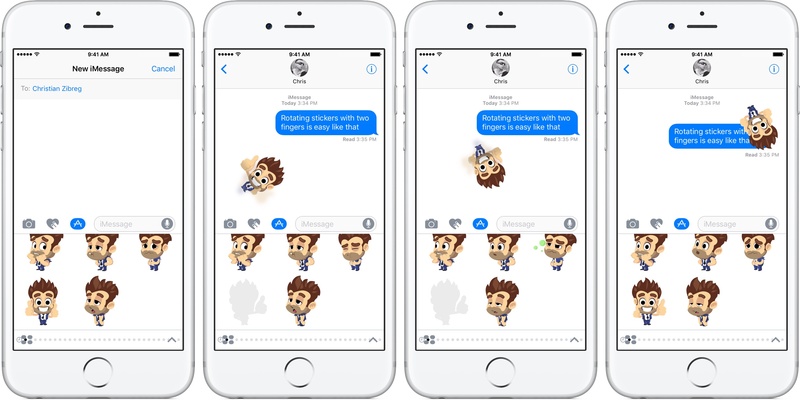 Sticker packs can be downloaded in the Messages App Store. You can browse featured sticker packs, see all stickers packs in the store, browse sticker packs by category and use the search feature to find ones you wish to add to your chats. In addition, it’s easy to download stickers your friends send you in conversations with just a few taps. When someone sends you a sticker you don’t have installed in Messages, you can easily see its originating sticker pack and download it from the App Store with a few taps. 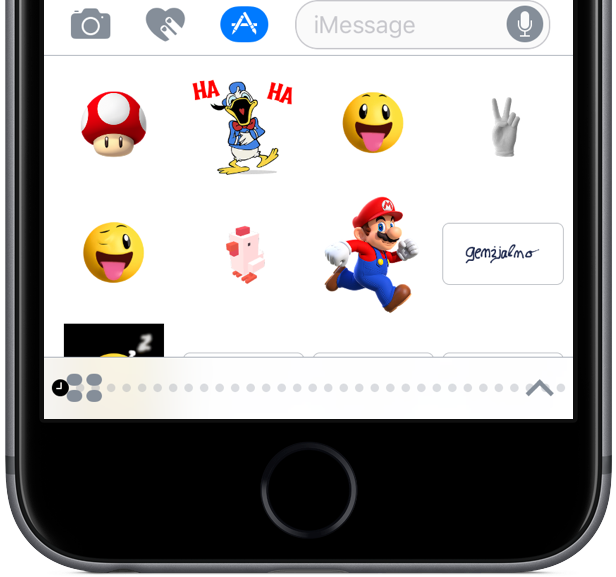 1) Open Messages on your iPhone, iPad or iPod touch and tap a conversation in the list which contains a sticker you would like to download. 2) If a sticker was sent standalone and not stamped on chat bubbles, tap and hold it, then select “From [STICKER PACK]” in the popup menu. 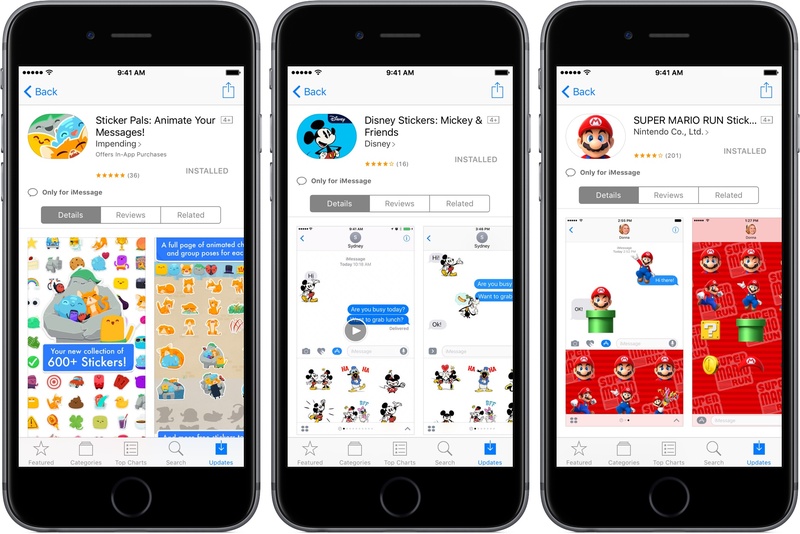 3) You’ll be taken to the sticker pack page in the Messages App Store. Tap the Buy or Get button to download the sticker pack to your device for use in Messages. 2) If a sticker was stamped on top of a chat bubble, photo or another sticker, tap and hold it, then choose Sticker Details in the popup menu. 3) On the next screen, tap the View button next to the sticker pack you’d like to download. 4) The sticker pack’s listing on the Messages App Store pops up in an overlay. Tap the Buy or Get button to download it to your device. As the screenshot above tests, a “Sticker by” label may appear below the chat bubble for stickers not installed on your device. Tapping the hyperlinked name of the sticker pack instantly takes you to its page on the Messages App Store. 1) Open Messages on your iPhone, iPad or iPod touch and tap a conversation in the list or create a new one. 2) Tap the Apps button (it resembles an App Store icon) to the left of the text entry field to access the Messages app drawer. 3) Hit the App Shelf button in the bottom left corner (it resembles four ellipses in a grid). 6) When you find a sticker pack you wish to use, tap the Buy or Get button to grab it. If this is a bundled sticker pack, it will be downloaded along with its container app/game. 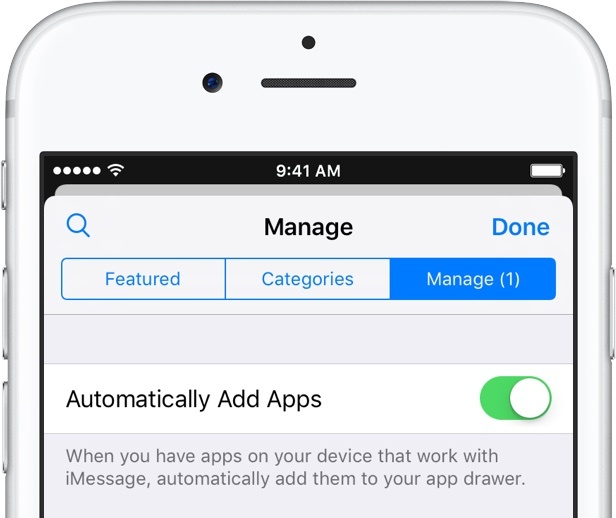 To have Messages automatically use any sticker packs bundled with apps/games you download, set the toggle Automatically Add Apps under the Messages App Store’s Manage tab to the ON position. As you download or update apps, their sticker packs appear under the New and Updated heading of the Manage tab so you can instantly see both your recently added sticker packs and those that have been updated with new content. 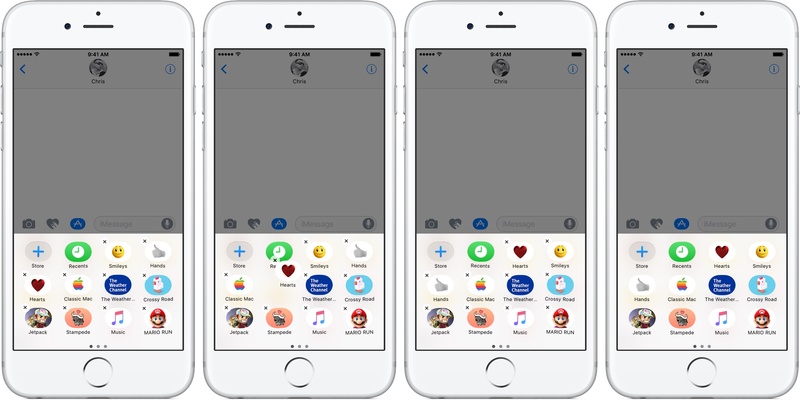 The Manage tab’s title and the Store button in the Messages App Shelf will use a badge to denote the number of iMessage Apps and stickers that have been updated. 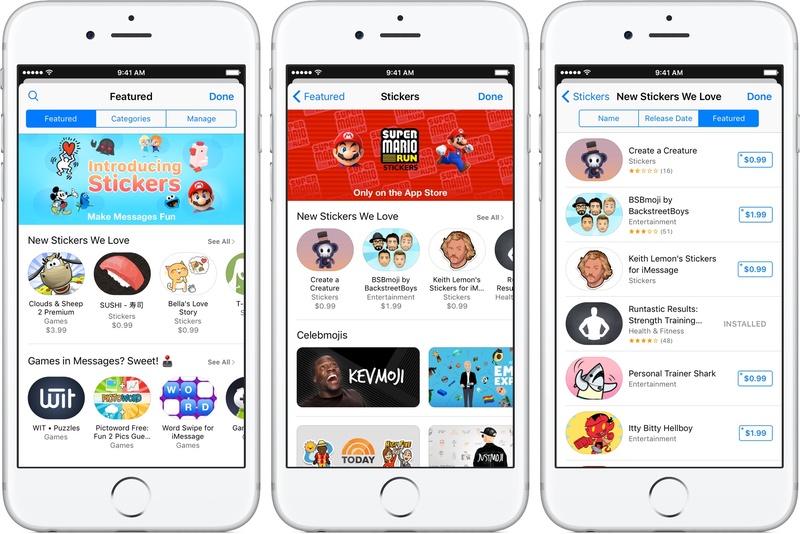 Tap the Featured tab to see a list of stickers, iMessage Apps and other downloadable content for Messages that was hand-picked and curated by Apple’s editorial team. To browse all of the stickers that are currently available in the Messages App Store, tap the Categories tab, then tap the All Stickers sub-category. Apple may add new sticker categories over time. Then tap the magnifying glass icon in the top left corner of the Messages App Store to find a specific sticker pack you want. Include the word “sticker” to make your query more relevant (i.e. “Star Wars stickers”, “summer stickers”, “sports stickers” etc.) and to exclude iMessage Apps and other unrelated content from your search. With your favorite sticker packs downloaded, it’s time to learn how to use them. 2) Tap the Apps button (it resembles an App Store icon) to the left of the text entry field to reveal the Messages app drawer at the bottom of the interface. Both methods are described right below. By default, the app drawer displays your recently used stickers, iMessage Apps and other third-party Messages content you have downloaded to this device. Swipe left or right to flip through your recently used stickers and other third-party content installed on this device until you find a recently used sticker you’d like to send. Tap the sticker to send it standalone in a thread or tap and hold to peel and stamp it on top of chat bubbles. To take your Recents fullscreen, tap the arrow pointing upward in the lower right corner. While in fullscreen mode, you can also tap a sticker to send it or tap and hold to peel it, which will exit the fullscreen mode so you can drop the sticker in your conversation. To cancel dragging the sticker, drop it on the Messages status bar at the top. To choose a specific sticker pack, tap the App Shelf button in the bottom left corner which looks like four ellipses in a grid. 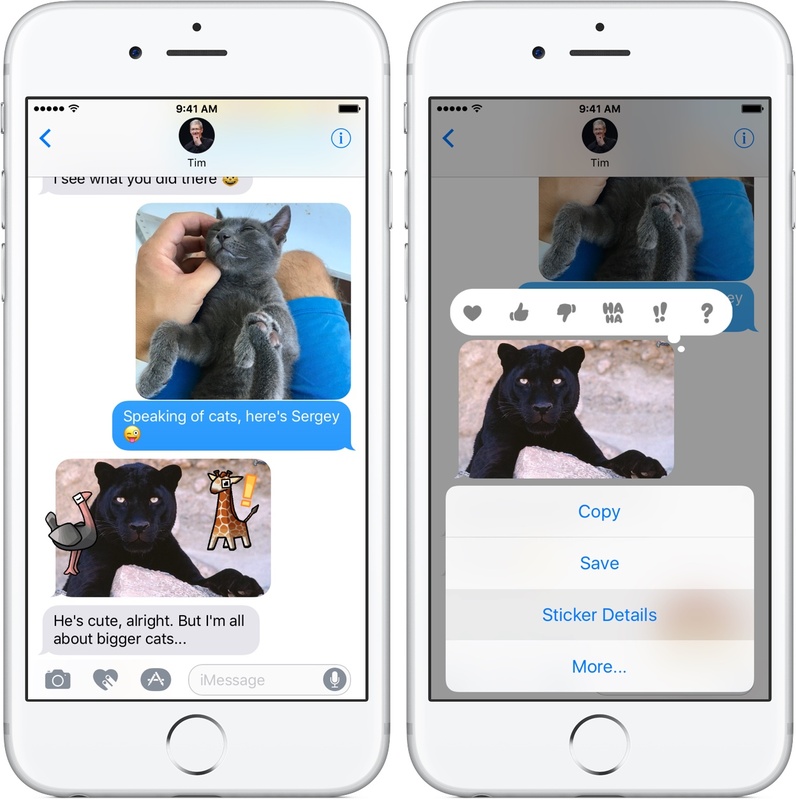 You can now swipe between pages of downloaded stickers and other third-party Messages content. Tap a sticker pack to see its stickers, then tap a desired sticker to send it, or tap and hold to peel it and stamp it on top of chat bubbles. To browse the chosen sticker pack fullscreen, tap the arrow pointing upward in the lower right corner. You can also rotate and resize a sticker before it’s sent. Just tap a sticker to add it to the conversation. You can accompany the sticker with an optional message before you tap the Send button. You can peel a sticker and stick it anywhere on the chat bubble: just tap and hold a sticker, then drag it over any chat bubble in your conversation and let go. Tap and hold a sticker you wish to use, drag it over a photo in the conversation and let go. The sticker must be dropped within the photo’s boundaries. Tap and hold a sticker you wish to use and drag it over a bubble, photo or another sticker in the conversation, but don’t let go. Tap and hold with another finger, swipe up or down to rotate a sticker, then let go. Tap and hold a sticker you wish to use and drag it over a bubble, photo or another sticker in the conversation without letting go of the finger. Now tap and hold with another finger anywhere on the screen and drag left or right to resize a sticker, then let go to release it. Any stickers stamped on top of chat bubbles, photos or other stickers in the conversation can be removed at any time by following the instructions below. 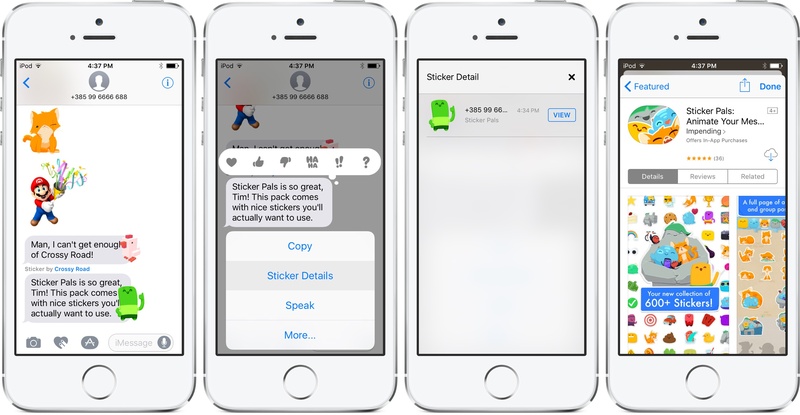 1) Open Messages on your iPhone, iPad or iPod touch and tap a conversation from which you’d like to remove certain stickers. 2) Scroll within the conversation to find a chat bubble, photo or another sticker that you stamped a sticker on top of, then tap and hold that sticker. 3) Tap Sticker Details in the popup menu. 4) A new screen pops up, listing all of the stickers stamped on the selected item. Swipe a sticker you wish to remove from the conversation, then tap Delete. Unfortunately, deleting a sent sticker doesn’t remove it on the recipient’s end. To delete a sticker that was sent as a standalone message (tapped rather than peeled), you’ll need to use a different method which is described further below. If you sent a sticker as a standalone message, delete it like you would a chat bubble. 1) Open Messages on your iPhone, iPad or iPod touch and tap a conversation in the list. 2) Tap and hold a message bubble with a standalone sticker you’d like to delete, then choose More in the popup menu. 3) Tap the Delete button. 4) Tap Delete Message in the popup menu to confirm the operation. The standalone sticker will be removed from your chat. 2) Tap the Apps button to the left of the text entry field. 3) In the Messages app drawer, tap the App Shelf button in the bottom left corner that looks like four ellipses in a grid. 4) Tap and hold any icon until the icon start shaking, then drag the icon to a new position and let go of the finger. To move the sticker pack to another page, drag its icon to the edge of the App Shelf and wait a moment until a new page swooshes into view, then drop the icon onto a desired position. 5) Press the Home button to finish reordering the icons. 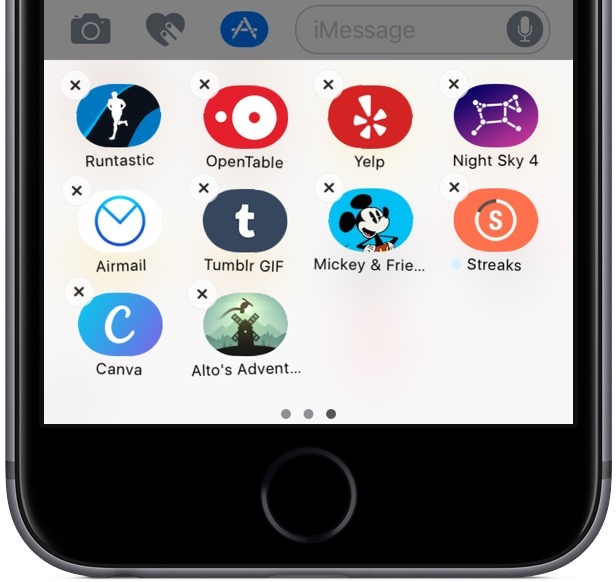 Delete standalone sticker packs from the Home screen or through the Manage tab of the Messages App Store. Delete bundled sticker packs independently of their container app in the Manage tab of the Messages App Store or delete the container app itself. 5) The Messages App Store appears in an overlay. Tap Manage to continue. 6) To uninstall a sticker pack, slide its switch to the OFF position. Bundled sticker packs like Canva, Alto’s Adventure and Jetpack Joyride can be disabled and re-enabled at any time as long as their container app is installed on your device. 7) Tap Done to finish making the changes. Standalone sticker packs you delete are instantly removed from the Manage tab. Disabling sticker packs which are bundled with apps/games won’t remove them from the Manage tab when you flip their switch to the OFF position. This lets you re-enable any bundled sticker packs through the Manage tab as long as their container app is still installed on your device. Delete sticker packs even faster: tap and hold an icon in the Messages app drawer and hit the “x” in the upper left corner to remove the sticker pack from Messages. Deleting a bundled sticker pack won’t automatically remove its container app from the device. However, deleting an app or game that came with sticker packs will also remove its stickers from Messages and delete the sticker pack from your device. 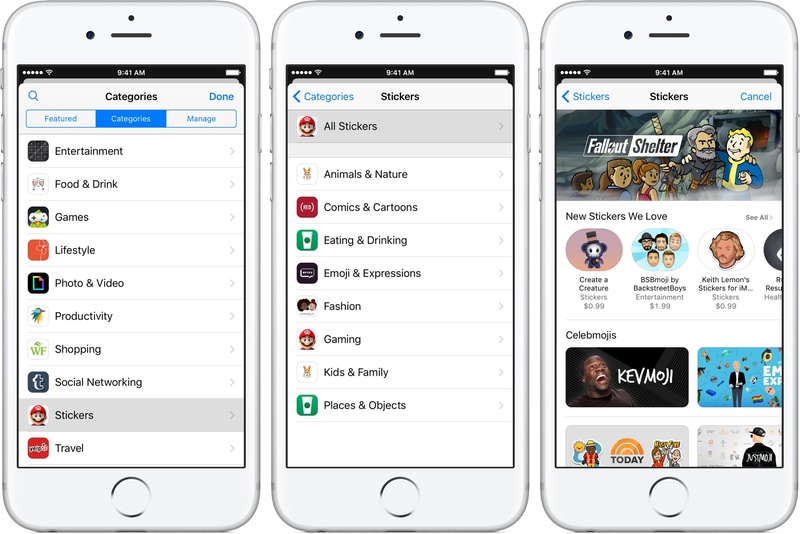 You can re-download sticker packs at any time through the App Store’s Purchased section in the case of standalone sticker packs. 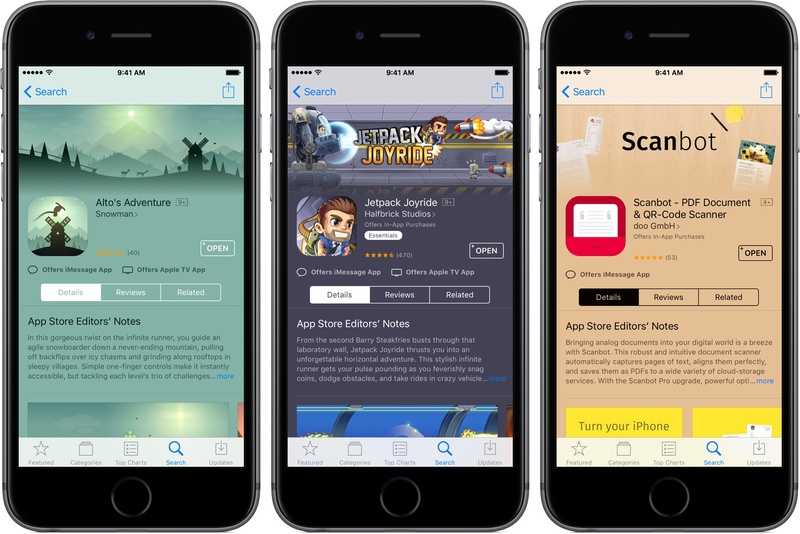 Bundled sticker packs don’t appear inside the App Store’s Purchased tab, but will re-appear in Messages once you re-download the app or game that package it. 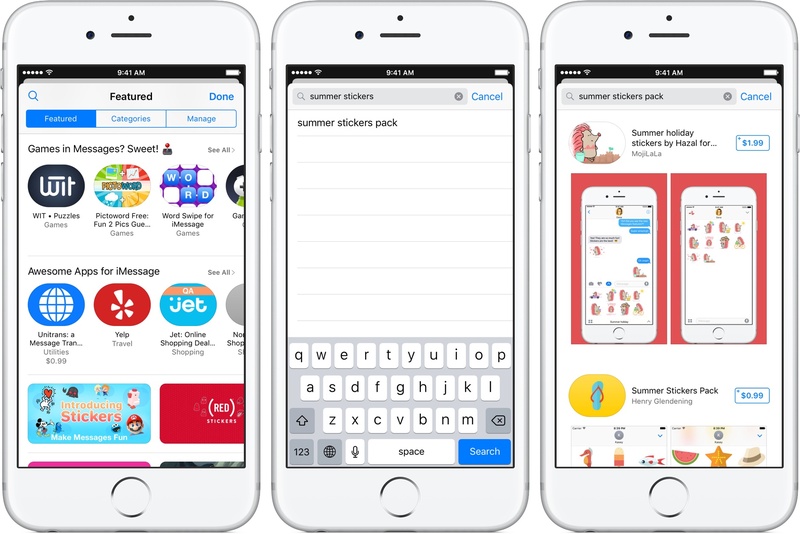 Like third-party keyboard, standalone sticker packs are packaged as native apps that you can re-download at any time through the App Store’s Purchased tab like you would any other app. 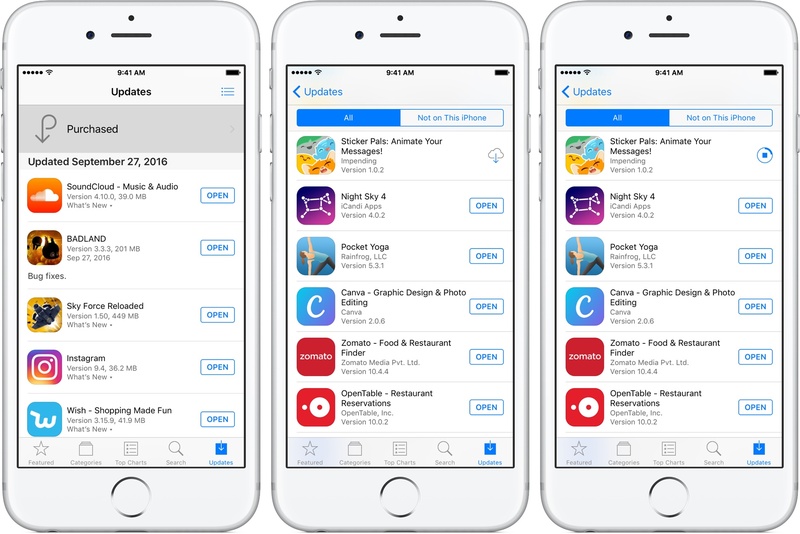 1) Launch the App Store on your device and tap the Updates tab. 2) Tap Purchased at the top. 3) Find a sticker pack in your list of previously downloaded or purchased items, then tap the cloud icon to re-download it to this device. Or, use the Messages App Store’s search to find and re-download the sticker pack. Because bundled sticker packs are packaged inside app/game binaries, they don’t show up in the App Store’s Purchased section. Not to worry: re-downloading the actual app or game in question will also re-add the switch for its sticker pack to the Messages App Store’s Manage tab so you can easily toggle it. 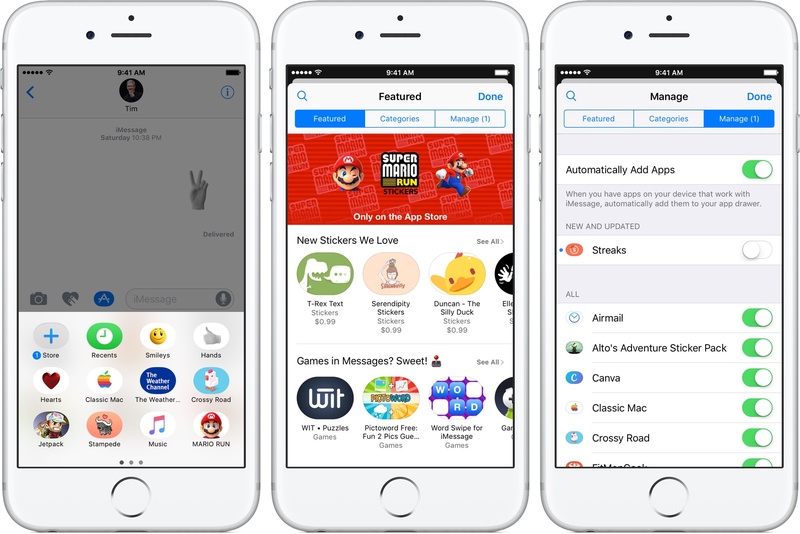 In addition to the regular App Store, the Messages App Store can also be used to find your previously downloaded apps and games with bundled stickers. 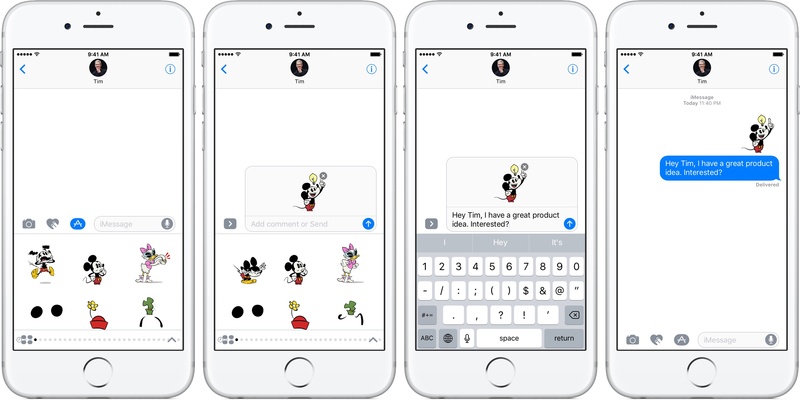 After reading this tutorial, you now know everything there is regarding stickers in iOS 10 Messages. If you like this how-to, please share it on social media and don’t forget you can send us your submissions for future tutorial coverage at tips@iDownloadBlog.com.